Surface studied by Sievert in 1886. Heinrich Sievert (? - ? ): German mathematician. An image in glass made by Richard Palais (recognize one of the 5 surfaces). 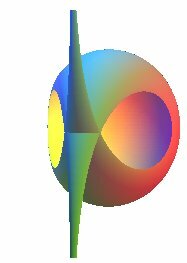 Sievert's surface is the outcome of the search for a surface with positive constant total curvature, like the sphere, that is not of revolution, and parametrized by usual functions. See also the surfaces of revolution with constant curvature.